Take her breath away with this stunning diamond Princessa cluster ring. Crafted from sleek 18ct white gold, this beautiful ring features a square princessa style cluster with diamond surround and diamond set shoulder for a look that totals 1/3 carat of diamonds. 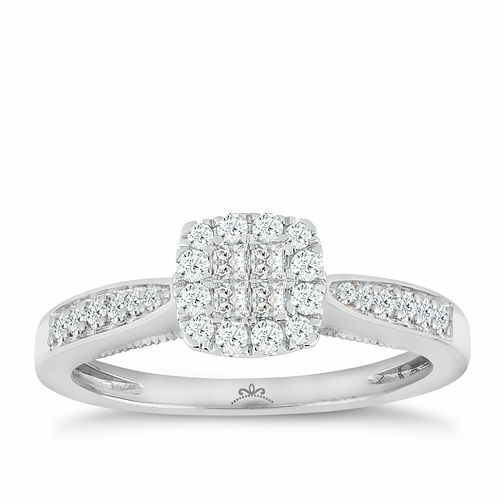 Princessa 18ct White Gold 1/3ct Diamond Cluster Ring is rated 5.0 out of 5 by 2. Rated 5 out of 5 by Anonymous from Beautiful engagement Ring My fiance proposed to me in Edinburgh and it was so romantic and beautiful! I could not believe how stunning the ring is! I'm so pleased and in love with it!